The nine guest rooms at Healing Waters Lodge were created with the comfort of our guests in mind. The Rookery is the largest and sits atop the original lodge building with a walk in shower, claw-foot style bathtub and dry sauna. The Heritage room is the only room with one king-sized bed and sits pond-side with a covered porch. The Lilly room, also pond-side, is named for Greg and Janet Lilly, the creators of the Lodge and is one of my favorite rooms. Granny Yates room (pictured) sits next to Lilly and is named for Greg Lilly’s pioneer grandmother. 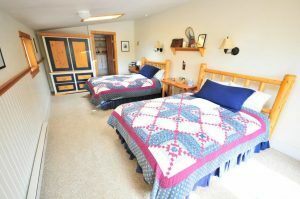 Chief Joseph is a large room with a renovated bathroom and has a private patio and wood burning stove. The four-plex are newer rooms: Henry Plummer, Franz Potts, Grayling and Bitterroot; each has a deck or patio and fabulous views of the Ruby Mountain range and country-side. Our rooms are spacious, clean, comfortable and unique.